Hello everybody! I know some of you are growing perilla leaves (Kkaennip, 깻잎 in Korean) in your garden. I’ve been so interested in reading all your garden stories every year, and seeing your photos of your big green perilla leaves! I have a small patio in my apartment in New York City, and you guys inspired me to grow my own kkaennip since last year. It’s so fun checking my kkaennip every morning to see how much they’ve grown since the day before, and harvesting the biggest leaves. Today I’m going to show you a recipe you can use for your perilla leaves. It’s a simple recipe, but once you see how it’s done you’ll be doing it all the time. It’s called Kkaennipjjim (깻잎찜), steamed perilla leaves. The key is in the timing, removing from the heat after 3 minutes to let them cook in the pan. If they are on direct heat for too long, the leaves go tough, wrinkly, and they will be shrunk! This way they are smooth and soft and keep their gorgeous green color. And of course delicious! Vegetarians can use 3 tablespoons soy sauce and skip the fish sauce altogether. And if you don’t grow your own kkaennip you can buy them in a Korean grocery store. Enjoy my recipe and enjoy your summer! In a small bowl, combine everything except for perilla leaves and mix well. Place about 30 perilla leaves in a shallow pot or pan. Starting from the bottom of the pile, spoon about 1 teaspoon of the seasoning mixture on to every other leaf and spread it around. Keep going up until all 30 perilla leaves are seasoned. Place the rest of the perilla leaves on top of the seasoned leaves, in the opposite direction so the pile evens out. Start seasoning from the bottom of the new leaves, every other leaf until you get to the top. Pour any leftover mixture on top of the leaves and into the pot. Cover and cook for 3 minutes over medium high heat. Remove from the heat and let it cook by itself in the hot pan for another 3 minutes. Open and serve right away with rice, or cool it down, transfer to an airtight container and refrigerate it for up to 1 week. Posted on Wednesday, August 8th, 2018 at 6:51 pm. Posted August 21st, 2018 at 11:46 am | Log in to reply. You surprised me by posting a food my husband isn’t familiar with. 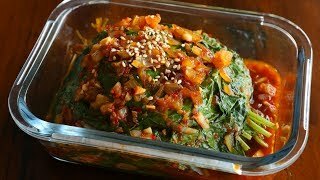 Is this a traditional side dish in Jeollanamdo? I have so many perilla leaves growing in my garden and I already made perilla kimchi this morning, but I’m really excited to make this too. I’ll send along a picture once it’s made. Posted August 22nd, 2018 at 8:43 am | Log in to reply. Hi mokpochica! It’s been a long time, I missed you! I hope your family is doing well and your children must have grown up by now! This kkaennipjjim is popular across Korea and is a typical side dish. Happy cooking! Posted August 26th, 2018 at 10:57 pm | Log in to reply. My twin daughters are 11 and my son is 9 now. :) I had to stop back and tell you that we LOVED this recipe. It might be my new favorite dish made with perilla leaf. I will make it again once or twice before I use up my leaves this year. Posted August 28th, 2018 at 8:57 am | Log in to reply. Wow they are 11 and 9! I remember you made mujigaetteok for them a long time ago! I’m sure they were well-nourished by your delicious and healthy homemade food. : ) Say hello to them for me! Someday I hope that I can meet them. Posted August 15th, 2018 at 12:41 am | Log in to reply. I love your blog and have been following it for a couple of years and now I finally registerd! I am very excited that I found Perilla leaves in the supermarket the other day. I love using them as wraps for BBQ meat in addition to lettuce. I am so excited to make try recipe. I also looked at your other perilla leave recipes and I had no idea that there are so many different ways to use it to make side dishes. Is this the classic panchan that you find in the grocery store and also served in restaurants? Posted August 11th, 2018 at 1:54 pm | Log in to reply. What a beautiful and tasty spread! I was wondering if sugar would have been used but you’re right- onion can be sweet! I love looking at plants and flowers . It’s always the little things that bring a lot of joy isn’t it? I saw huge perilla leaves at the Korean Market here. They smell so good! Posted August 11th, 2018 at 10:43 am | Log in to reply. Wow you have a lot of food to eat! Haha hope you enjoyed your meal.. 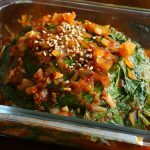 This recipe was originally posted on August 8, 2018 at 6:51 pm by Maangchi. The video was watched 167,934 times on YouTube & has 6,184 likes!